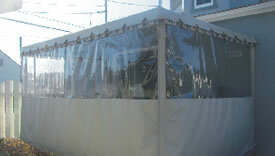 Convert your patio awning or canopy into a porch enclosed on all sides with fixed screened panels. Enjoy beautiful summer evenings free of the annoyance of unwanted mosquitoes. To learn more, contact one of our awning representatives in Gatineau. A pleasing combination of fabric and clear plastic windows create an enclosure that can extend your enjoyment of the outdoors. Add rods and sliding curtains to your awning or canopy. You can open and close your patio whenever you wish. The full-length-fabric curtains offer more comfort when the sunshine is unbearably hot or when the breezes become too windy. The curtains can also add privacy for gatherings with family or friends. © 2019. Auvent Nouveau Inc. Tous droits réservés.